Recommended to: Readers who enjoy exciting adventures that mix a little bit of scary with a whole lot of fun! The Death's Academy entrance exam for Midnight Smith is quickly approaching. There's just one problem: Midnight is the worst exam taker the academy has ever seen. If Midnight wants to ever step foot inside the school, he'll have to join forces with the hated Guardian Angels, and together face the deadliest creatures in the world--the dreaded Unicorns. Becoming a Grim Reaper has never been more hilarious! Pure pandemonium. That's how I'd describe Death's Academy. Of course, I mean this in a completely positive way. This book falls way outside a lot of Middle Grade fiction I've read lately, and I loved it for that. It's funny, it's random, and it has a whole bunch of heart. If you're looking for a book that will make your young reader laugh out loud? You've found it. Bast's story plays to all the things young readers love, and it's a pretty fun romp for us adult readers too! Midnight Smith, or Night as he prefers to be called, is a protagonist that is easy to identify with. Just like normal "shorty" kids, he has nagging parents, a difficult time staying out of trouble, and an awesome best friend. The difference between Night and other kids out there? He's a reaper in training. A "hoodie", if you will. When you live in a world where everyone wants nothing more than to get into Death's Academy, there's a lot to prove. Especially when you have a father that's pegged as the worst reaper ever. Yup, Night has it tough straight from the beginning. I eagerly followed along as Michael Bast built a world of reapers that we "shorties" never see. A world where Hellhounds are disguised as Chihuahuas, hearses look like beat up vans or police cars, and all manner of other amazing things hide in plain sight. In fact, I was wholly impressed with how effortlessly Bast explains everything in Death's Academy. Each time I even had an inkling of a question, the next paragraph or two would explain it. If only every book out there had that much foresight, I'd be a happy reader. The one downside to this is that the story takes a little while to get going. There is so much to explain, that the first half of the book is pretty much an introduction to the world. It's definitely helpful to feeling immersed in the story, but it does read a little slowly too. Things don't pick up until about half way through, but they do pick up! Once they do? Hang on tight. It's a crazy, wild ride until the ending. 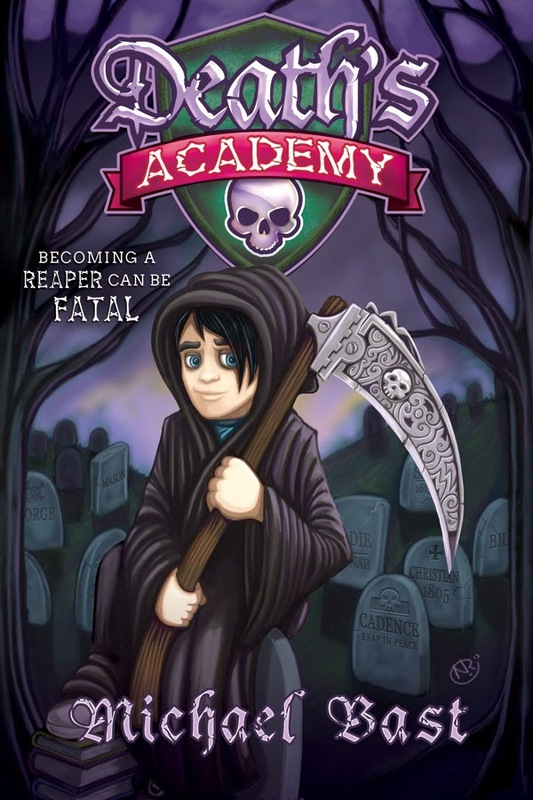 As an adult reader, I'm happy to give Death's Academy a solid three star rating. It was fun, out of the box, and it definitely made me giggle more than once. If I were in the age group that this book is aimed at, I'll be honest and say that I'd probably give it four stars. While dog farts and evil unicorns don't have the same effect on me they did when I was 12, I still got a kick out of them! If I did? I know plenty of young readers who definitely will too.